Are we having fun yet? You betcha (how Midwestern is that?) Each stop in the past few weeks has been different, interesting, and exciting. We hope our string of successes doesn’t let up. Having the good sense to get out before we were thrown out of Sandi and John’s welcoming arms, we headed into the Berkshire Mountains (NW Massachusetts) for a rally with other like-minded campers in T@Bs and T@DAs. There’s a great affinity among those of us with these unique campers – whether we share like political views, or have similar family situations – it doesn’t matter. There’s a kinship there that’s wonderful. Hard to explain because it sounds silly. It’s not. We had about 18 campsites occupied, with singles, couples, old and young, plus bunches of dogs. All good. Our rally HQ for a long weekend was Historic Valley Campground in North Adams, MA. Driving there on Thursday was uneventful, until we hit some steep hills. Not long, but steep, and we knew we were close to our destination. The autumn color we had expected was non-existent. Apparently, this area has experienced very dry conditions for the last many weeks. Trees were greenish/gray and tired-looking. More ready to drop their leaves from exhaustion than from having spent their energy with color. The only fallen leaves we see are dead ones – no paths strewn with color. Friday seems like a beautiful day to stretch our legs with a hike. Yay! 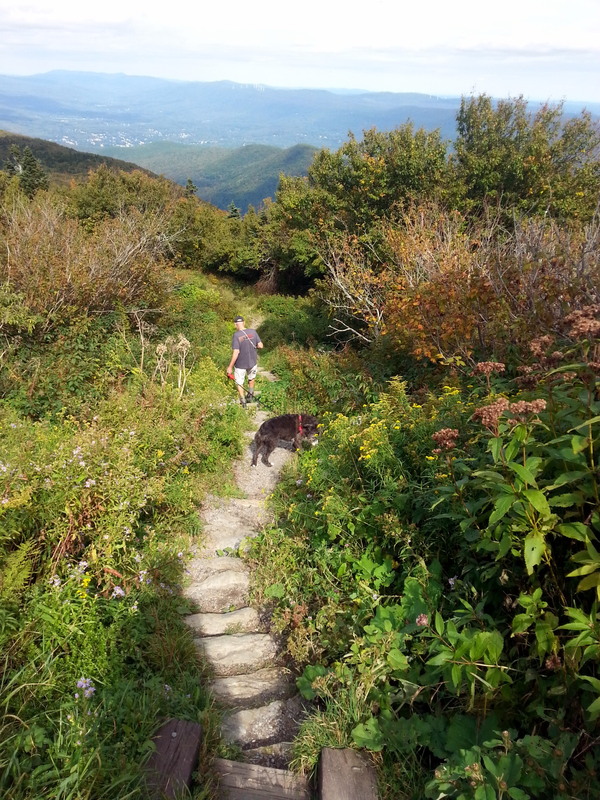 The Appalachian Trail runs very close to camp, including a stretch up and over Mt. 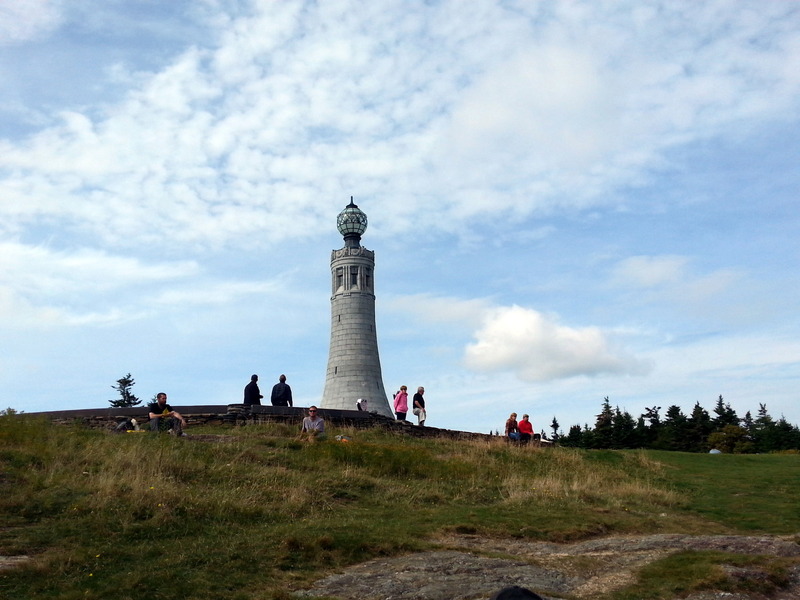 Greylock, the highest spot in Massachusetts. How could we not hike this stretch? Even better, there’s no dog restriction as long as they are leashed (Jezzy NEVER is allowed off her leash. Ever.) We make a pack lunch, grab a couple liters of water, and jump into the truck to find the Trailhead. Yikes! These roads are not for cowards. We pass a few signs that say 17% grade, and suddenly the nose of the Firetruck is pointed into the sky, or down below our windshield view. So glad I’m not driving – I can put my head down and mutter little grunts of fear or relief. 17% might not sound like much, but that is Steep! The AT at this point is pretty interesting. 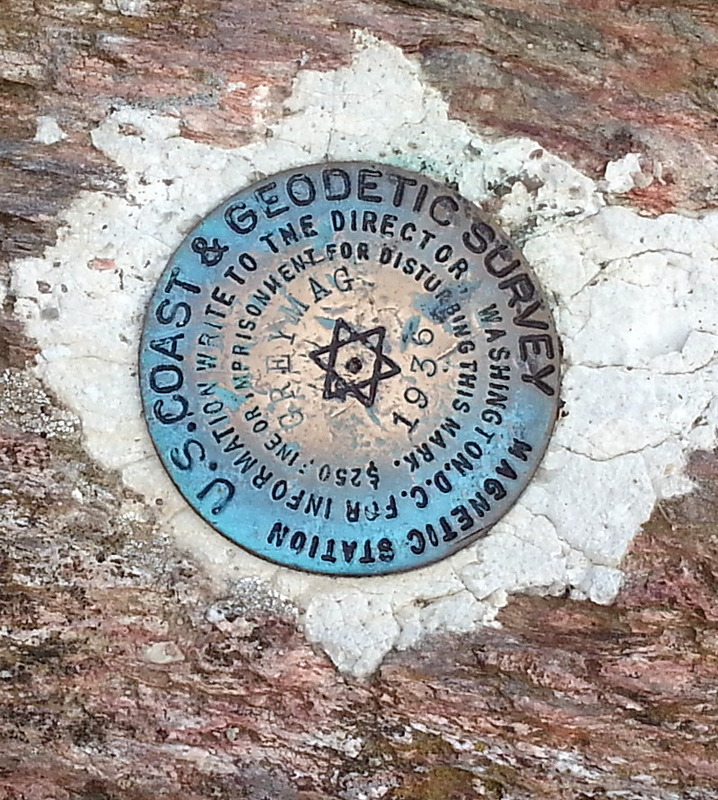 We’ve got a 3.6 mile uphill to the summit at Mt. Greylock and a return down the same path. Climb up, scamper down. The Trail surface is uneven rock – not difficult to maneuver, but tiring, because footfalls are never level – we were constantly teetering off pointy little rocks. But, this was oh so worthwhile……when we finally crested Mt. 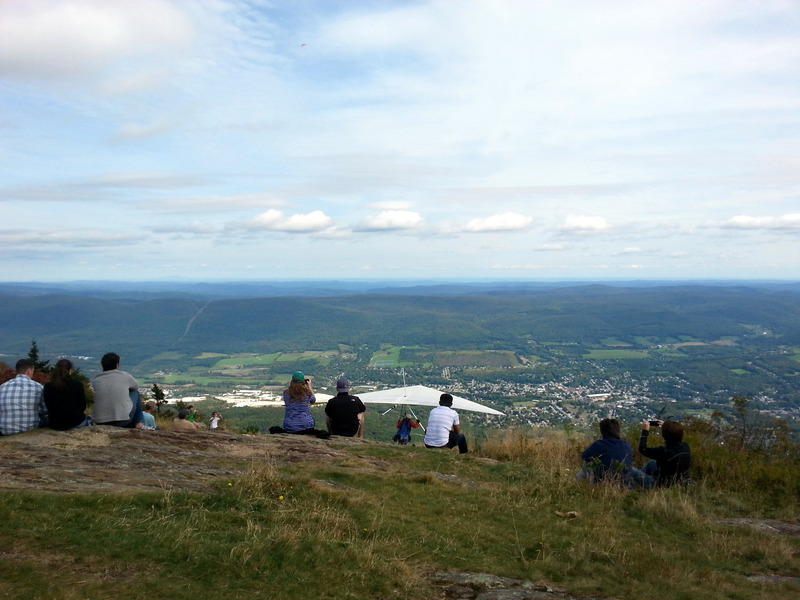 Greylock, there was a contingent of hang-gliders leaping off the peak into the breezy void. What a treat to watch. A big crowd had gathered – thru-hikers who were taking a breather, a few day hikers like us, and many who had driven to the peak to see the view. It was hot and still – perhaps not an ideal day for the kites, but pleasant nonetheless. We ate our sandwiches, and gave our leftover snacks to a hungry-looking thru hiker. Many of these guys are living on ramen noodles and raisins, so he was surprised and happy to receive crackers/cheese and chocolate. Our legs took a pounding that day, and we were happy when we arrived back at the Firetruck. Jezzy was a trouper to hang in there, but we could tell that she was exhausted as well. The next day, John hung around camp and washed the Fireball. Three weeks on the road take a toll, and she was looking pretty shabby. The Firetruck was taken into town and treated to a real car wash. We feel better when are gear isn’t looking quite so sad. 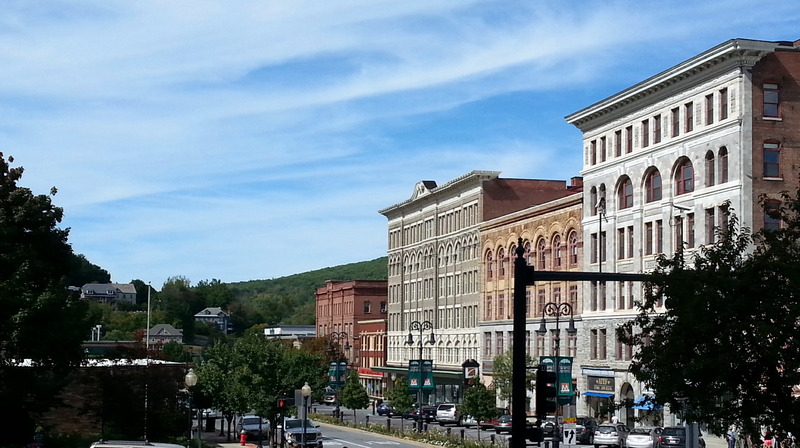 I decided to cycle into North Adams to find the farmers’ market. I got to ride down one of those 17% grades. Yikes! Thanks again, John, for putting new hydraulic brakes on my mountain bike. That was a nail-biter of a descent to a stop sign at the bottom of a very steep road. Loved the small, but colorful farmers’ market. This duo performing Sylvia, won me over. Found all the stuff I needed for a great grilled vegetable dish for the rally potluck Saturday night. I wandered around a bit, taking a few photos of the extravagant New England views. 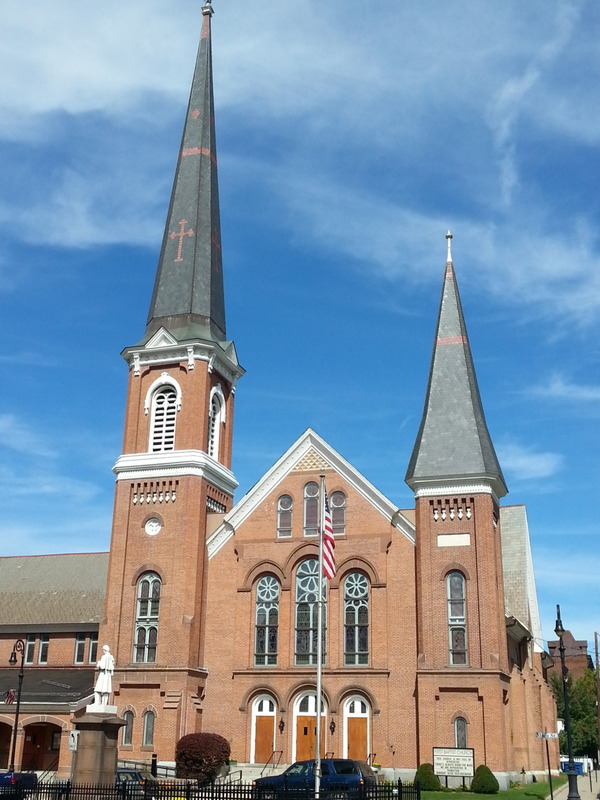 The small towns here are all so picturesque – it’s what you imagine New England to look like in your dreams. 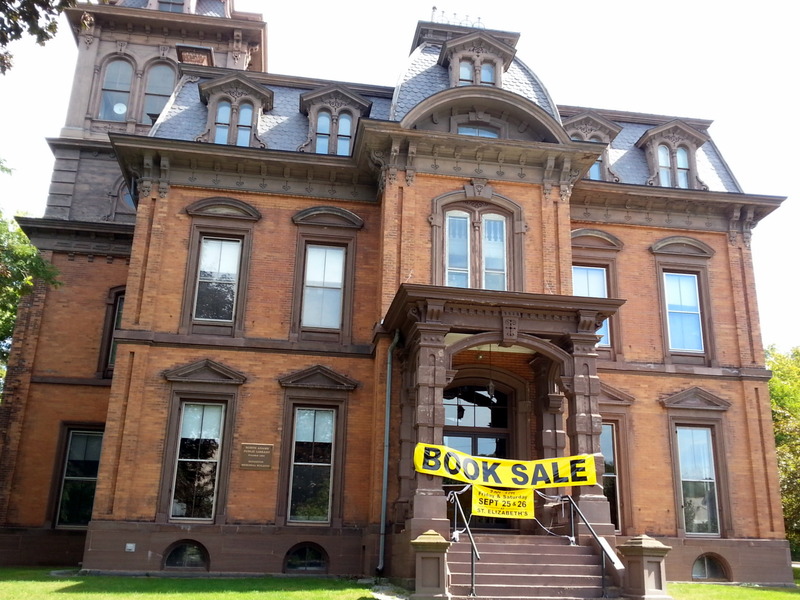 Can you believe that this building is the town library? We spent the rest of the day chatting with our fellow campers, checking out their trailers, having our checked out as well, and exchanging tips on campsites, storage, maintenance, and camping philosophies. We’ve learned lots from our fellow campers at these rallies. T@B trailers were first produced in 2004, discontinued by the original manufacturer in 2009. T@DAs followed in 2008, discontinued in 2010. About 1500 T@DAs were produced in all, the majority titled as 2008. Ours is a 2009. We suspect they were all manufactured at the same time, and simply titled out as the manufacturer sold them thru their dealer network. Little Guy Trailers has been making the T@Bs since 2010, keeping the original shape and feel, but improving many features and construction issues. Our rally was a great combo of new/old T@Bs, plus one other T@DA. One T@B really caught my eye. 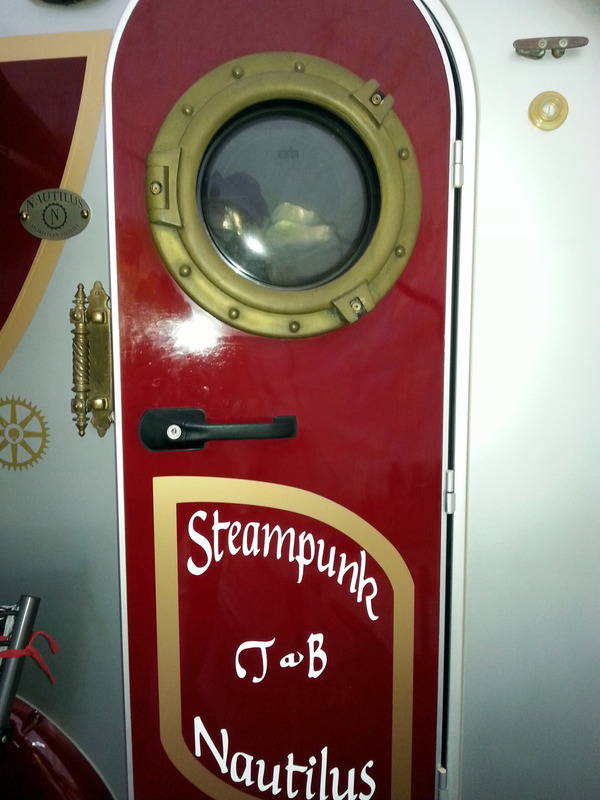 A Steampunk-style T@B owned by Bridget and Ed. They’ve gone to great lengths to customize their amazing trailer. My photos don’t do it justice, but all the small details are incredible. 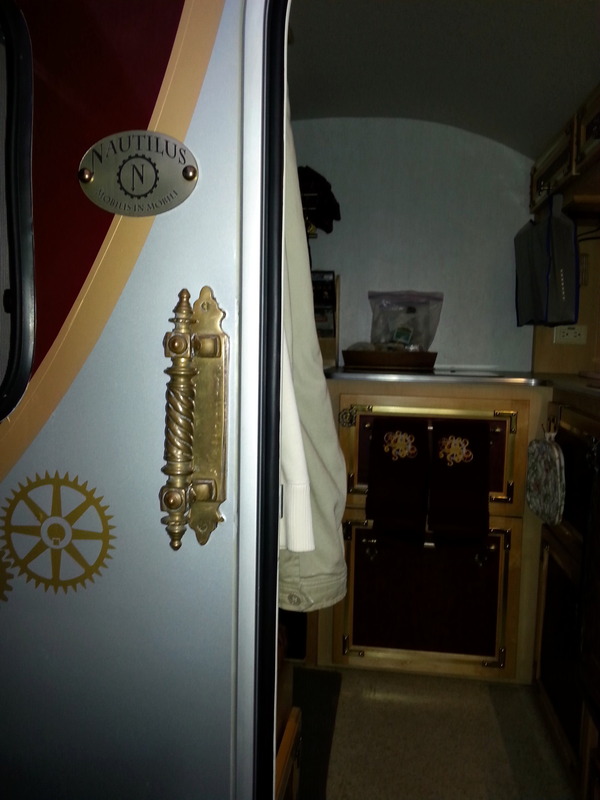 Bridget found a custom trunk from an old 30s Hudson, which has replaced their standard propane tank holder. All the trim on the T@B has been removed and painted to match, complete with brass accents and decals. It’s amazing. We find that folks with these small campers go to amazing lengths to customize their rigs to match their style and comfort levels. 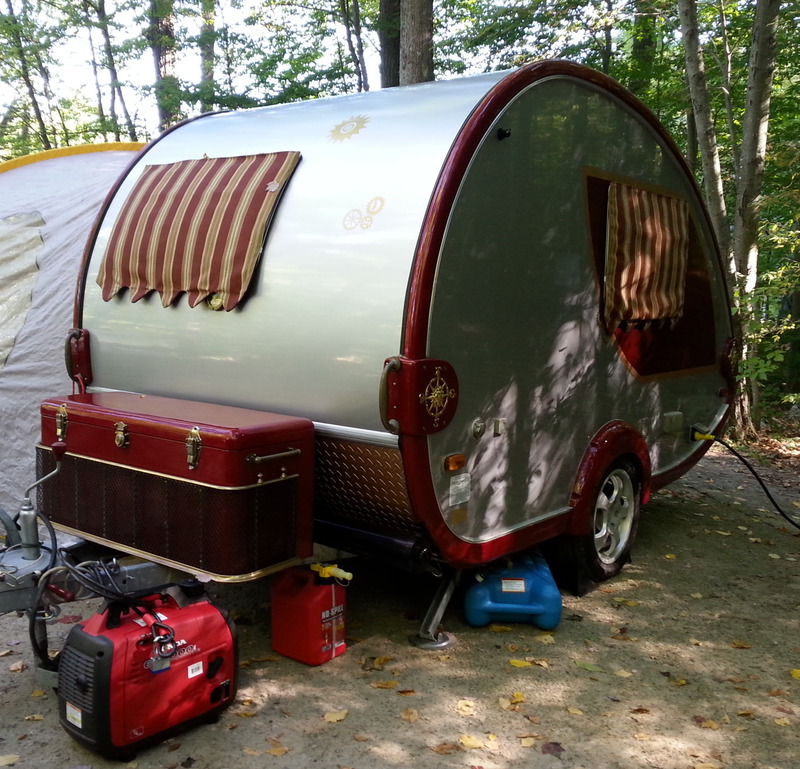 One couple, Bob and Carol were spending just the fourth night in their brand new 2016 clamshell T@B. Although I love the comfort of being able to get out of bed and make morning coffee inside, I love the true camping feel that a clamshell offers. Maybe I’m just not tough enough. We cook everything (but coffee) outside, but love the flexibility of having a fridge inside. Maybe I’m just a big sissy, but I’m NOT going out in the rain to make morning coffee! Sunday morning, we said our goodbyes and headed off to Newport, RI. Each of our stops in New England (so far) has been so different from the last. We’re expecting that trend to continue with millionaires and jazz in Newport. 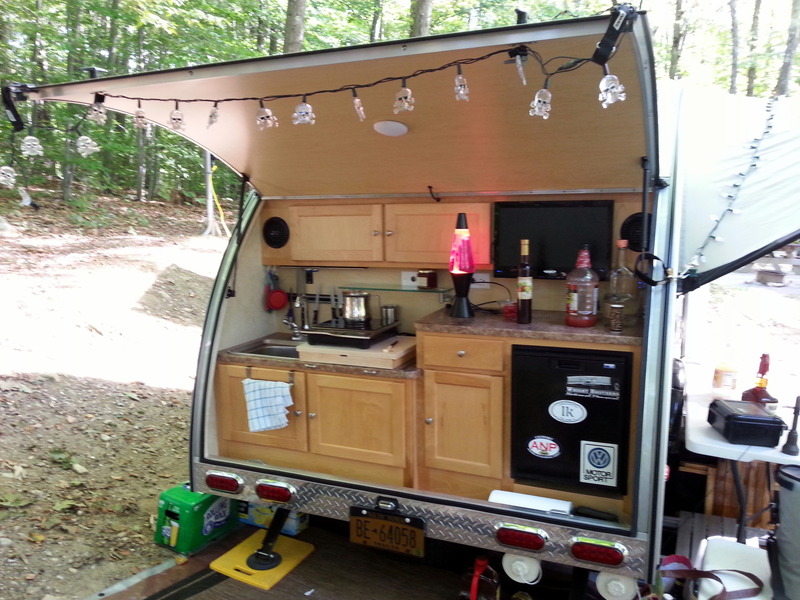 This entry was posted in camping, retirement, RV life, simple camping, T@B, T@DA and tagged Appalachian Trail, camping, clamshell, hiking, historic sites, Massachusetts, road trip, RV life, simple camping, T@B, T@DA, the great outdoors by Judy Crankshaw. Bookmark the permalink. We were planning to camp on Long Island for the weekend, but have decided to scoot inland a bit, and hope for the best, weatherwise. We got absolutely bombed with rain last night – could use some water wings for the Fireball! 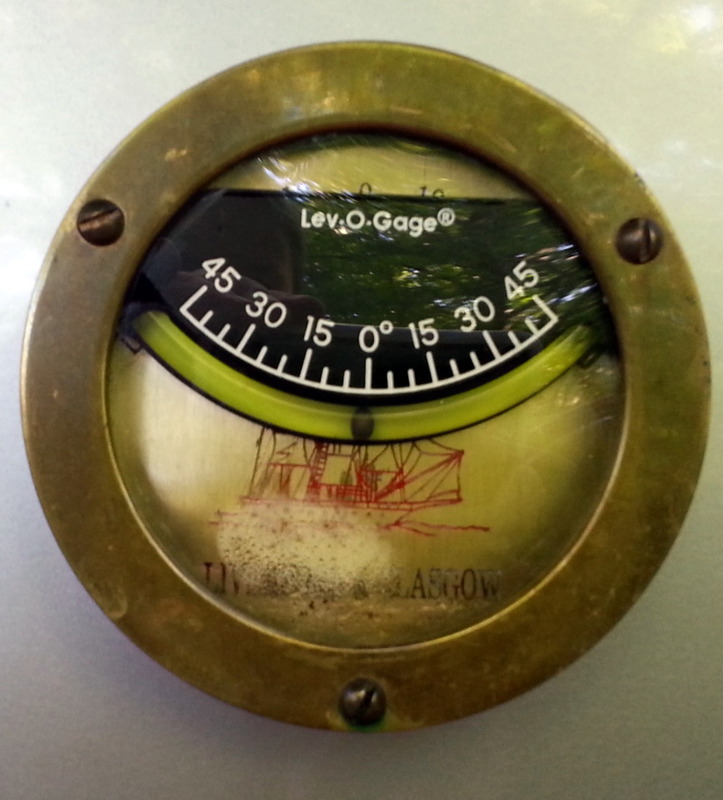 You are so right about the kindship between owners of “like” equipment. Rallies are a such a nice way to peek inside other campers and see the amazing things people do in such a small space. You two were great trail angels – giving surprises to the weary thru hikers. They still have a ways to go before reaching Maine. Thru hikers have my admiration. They come from behind, busting up the Trail like its nothing. Can’t imagine doing that day after day. I’m sure there are plenty of not so scenic areas! I was skeptical about going to our first rally, but we are now committed ralliers. We’ve made some great friends in the past three years in this group. What a great post! The views from the top of of Mt. 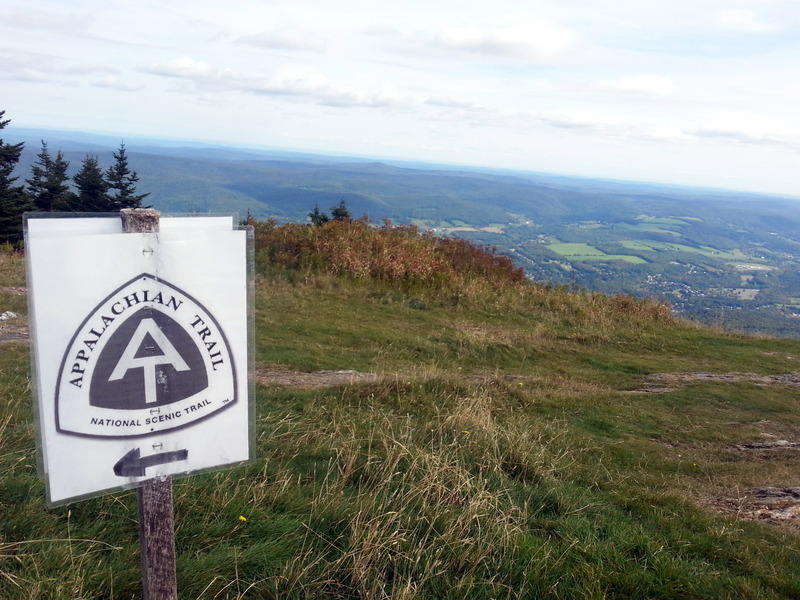 Greylock were wonderful, I’ll bet that the hang gliders were treated to some spectacular views. The old buildings were very interesting, I wish that there were more of them around here. People sure do put a lot of work and love into their campers, making them one of a kind, and their own. I hope that you don’t get washed away in the rain from the storm this weekend, stay safe out there! 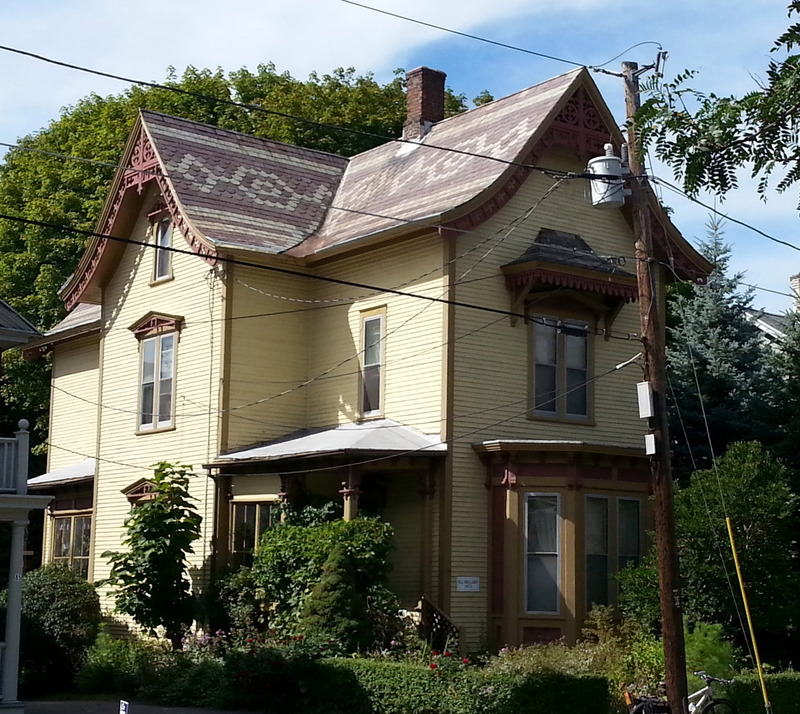 I also wish there were more old buildings in our area. Still mourn the teardown of the old Federal Building. That was such a treasure. It would be a disaster if all these beautiful old towns had allowed themselves to be overtaken by strip malls, for the sake of convenience. We’re continually amazed at how not-Michigan everything is our here. I”m also wondering about the ride back up that 17% grade. Did you have to walk? I know I would have! Can’t see some of the photos, probably a browser issue. Will try something else. A couple of the photos are videos. Maybe that’s where you are having a problem. Can’t offer any suggestion as a remedy. Maybe you don’t have enough bandwidth? Yes, I did have to walk. Got started, and could tell that I was faltering. Decided that it was better to exit the bike, than have the bike exit me! Damn old age, anyway. Thanks for checking in, Robin. That library is vaguely similar to the library in Ionia. Very cool. I bet it has some sweet little nooks hidden among the stacks. I love your eye for interesting and unique scenes. You pay attention to the same things that I love to explore. But that 17% grade sounds challenging. Did you have to ride back up with your groceries? What a wonderful world. Oh Yeah! I didn’t make it up the hill on my bike. First hill I’ve had to walk in years. Think I could have done it, but I was riding my mountain bike, which is fairly heavy, plus I had about 15 pounds of stuff from the farmers market in the panniers. About the time I was beginning to roll backwards, I unclipped and jumped off. Bummer. Didn’t stop to visit the Library. Bet you’re right about the interior.